An opportunity to visit Cambridge as my husband had a business meeting there recently. I’ve only been to this university city a couple of times and its many years since my last visit. We parked our car at Homerton College where the meeting was taking place so I started my tour of the Colleges here. Homerton is located outside the historic city centre and is a mix of old and 1960’s buildings arranged in a parkland setting. The focal point of the college is its Victorian gothic hall, featured below. I then walked into the historic centre which took me 25 minutes along the main road. There was little of note to see on the way until I reached Downing College just outside the pedestrian zone. It’s possible to walk around the grounds admiring the neatly tended quads and beautiful buildings of several of the University Colleges except for the most famous ones where an admission fee is charged. Downing College was founded in 1800 and is set amidst 20 acres of parkland. Many of its buildings were influenced by Greek architecture. 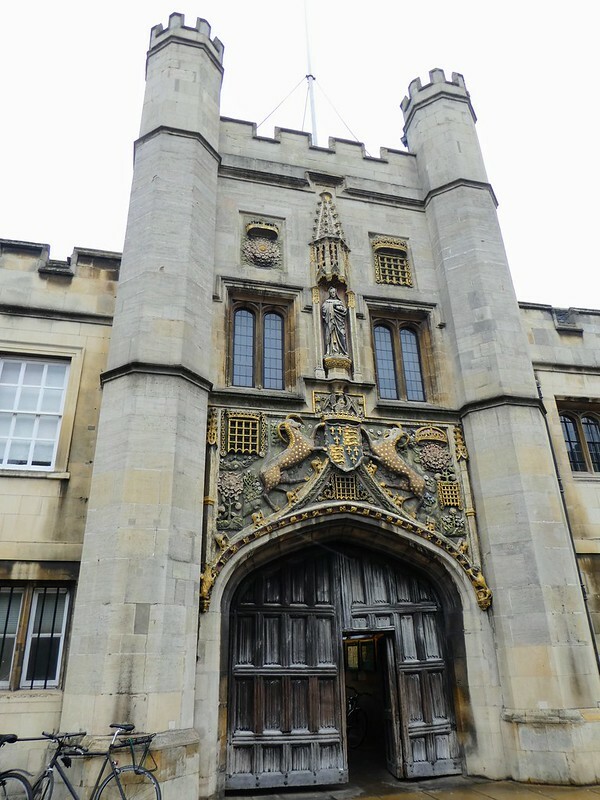 Continuing my tour of the city, I made my way along narrow, pedestrianised roads to reach Christ’s College on St. Andrew’s Street with its magnificent Great Gate. 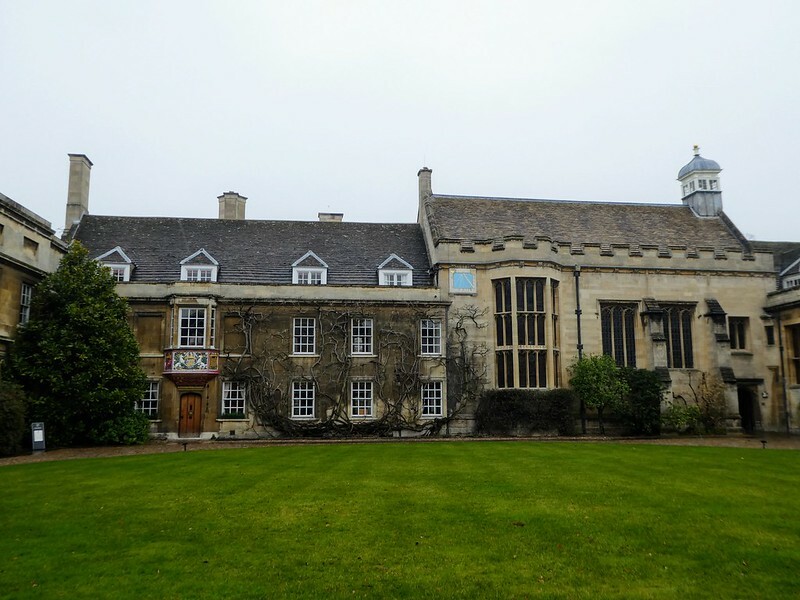 This college was first established in 1437 as God’s House for training Grammar School masters. Amongst the other parts of the University I wanted to visit was Trinity College, the largest college of the University of Cambridge. 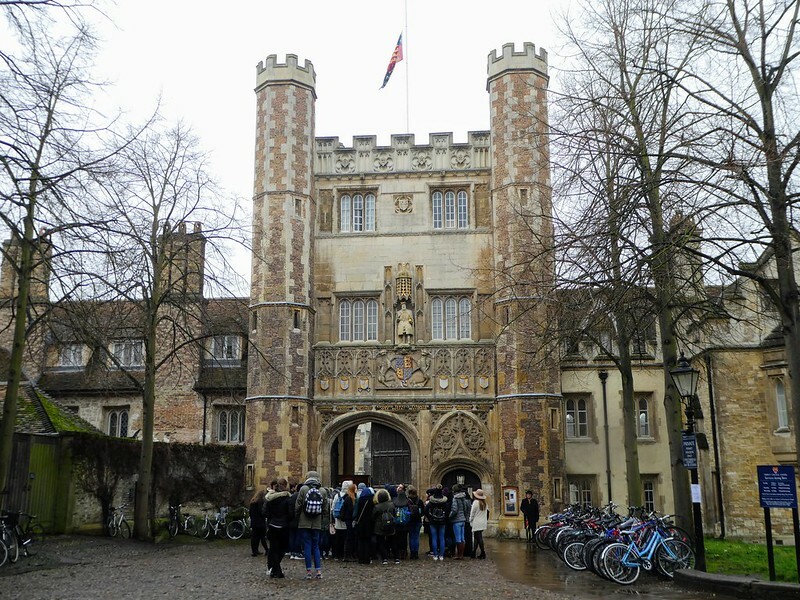 This college was founded by Henry VIII in 1546 and since then, its former students have won 32 Nobel prizes – the highest number of any college. Former students include six British prime ministers and the Physicists, Isaac Newton and Ernest Rutherford. Located just behind several of the colleges is an historic park known as ‘The Backs’. I walked along the riverside footpath seeing the famous ‘Mathematical Bridge’. In summertime it is beautiful to wander along here when the weeping willow trees are bright green and the neatly tended college gardens can be seen. Despite my visit being in mid winter some hardy souls were taking trips on punts along the River Cam. Heading back into town I came across the Church of the Holy Sepulchre which is known simply as The Round Church. 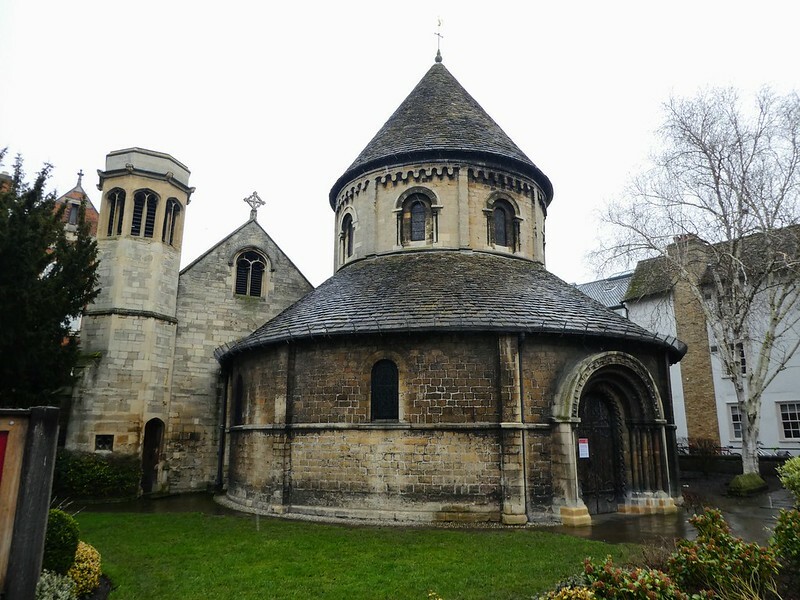 It is one of only four medieval round churches still in use in England and was founded in 1150. Finally, after all that walking it was time for me to find somewhere in the city centre for a warm drink and snack. I enjoyed my time in Cambridge, it’s a very busy place with lots of tour groups and overseas visitors jostling for space with university students weaving in and out of the crowds on their traditional bicycles but it all adds to the charm and life of the historic centre. The city is easily accessible from London, taking 50 minutes by train from Kings Cross Station or approximately 1 hour 40 minutes by road. Poundbury – a new town with a difference! Isn’t it marvelous how the English treasure their historic structures? This is definitely a lesson we might learn. Yes, it’s do sad that so many beautiful buildings have been demolished to make way for modern monstrosities, Hopefully lessons have been learnt and this won’t happen any more. I’ve never been to Cambridge before but these photos are beautiful. Thank you for your kind words. Cambridge would have looked even more beautiful if it had been sunny! I’m heading to London this December and wish I had time to visit Cambridge, but we only get three to four hours of free time per day. That’s a shame, hope you get another opportunity to visit Cambridge soon. Thanks for your welcome thoughts. hey great post and i love the photographs !!!!! This looks great! I’ve only been to Cambridge once and got told that the mathematical bridge was built without nuts, bolts or screws, just physics alone. Is this a myth?? If anyone has seen a brown-and-white cat in the Cambridge area with the name ‘Department of Quantum Mechanics’ on its collar, could you please check to see if it is alive or dead. I used to keep it in a box but it escaped. That’s a real positive thing to read Jason. Thank you for taking the time to read my blog. Thank you for your interest in my Cambridge post. Thank you for your kind words, I’m pleased you enjoyed reading my post. Thanks Stacy for your kind words. 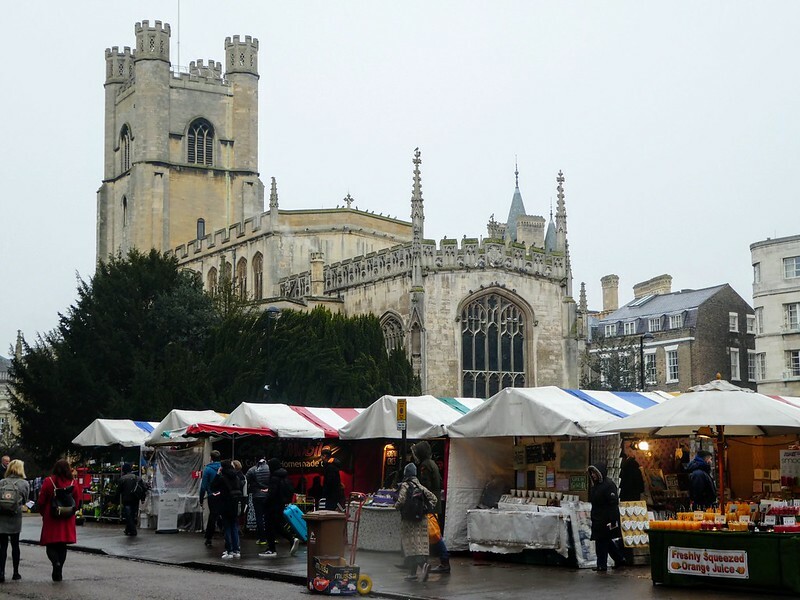 It’s pleasing to read you enjoyed my post on Cambridge. Thanks for these photos. I love Cambridge, and it was like having a little visit in the middle of my work day. Thank you for your lovely feedback, I’m pleased that my little post on Cambridge brightened up your day! Thank you so much for your inspiring comments. It’s so nice yo read that you are enjoying my blog. So beautiful! The architecture makes my heart swell! Thank you for your kind words and for reading this post. Very interesting and nice photos. We just visited Oxford last October so Cambridge is definitely place I want to visit someday. Thanks for sharing! Thanks Mira for your kind words. I’m pleased you enjoyed reading this post and hope you get an opportunity to visit Cambridge soon. My husband went to Cambridge; I showed him the pics. Beautiful bldgs. Thanks Laurie, I’m so pleased you enjoyed reading my post. Thanks Tanja, Cambridge is a really nice city. 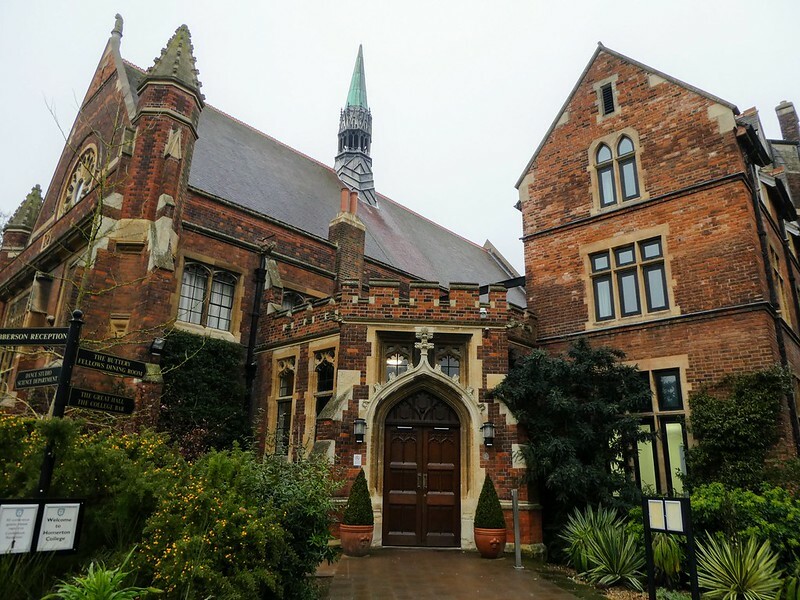 I was in Cambridge last week myself, but I was so busy going to museums, I didn’t have time to see the bridge or most of the colleges, so I enjoyed looking at your pictures to see what I missed! Thanks Jessica for reading my Cambridge post and for your kind words. I hope you had better weather than me! Thanks for your kind words Siba, it’s so pleasing yo read you are enjoying my blog. I hope you too go through my Blogs on different subjects apart from Photograohy ! I will definitely do that. Thank you for taking the time to read my posts. I’ll look forward to reading your other Cambridge posts too. I had dreadful weather but still enjoyed myself. Nice photos and beautiful place! Thanks Saira for your kind words and for taking the time to read my post. beautiful buildings! 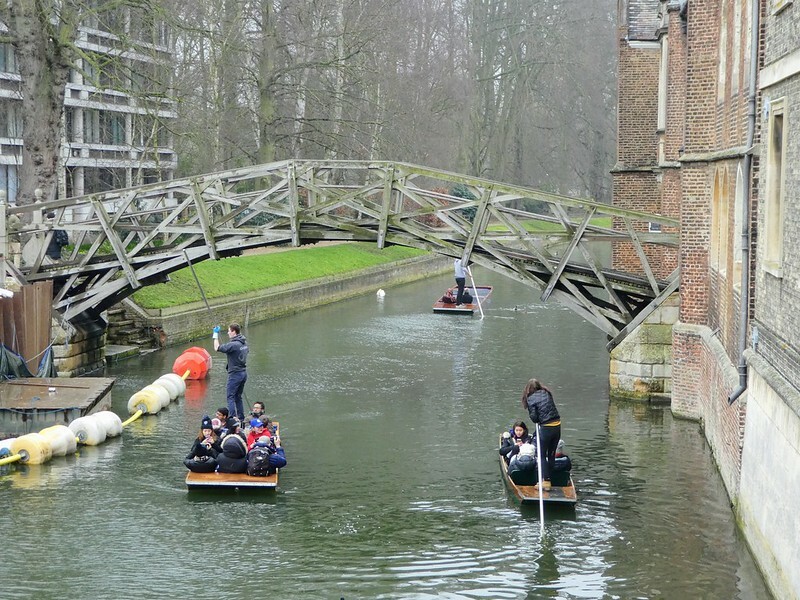 And I love the picture of winter punting–beautiful! Thank you for reading my post and for your much appreciated kind words. Great post. Sounds like you got in a lot of walking that day. I loved the architecture and I, too, loved the round church. I find it interesting that they charge admission to some of the colleges, just to walk around. Thank you for your kind words. I think it’s a bit mean to charge people to walk round the college grounds. I just hope the university spends its money on maintains no its buildings and keeping the gardens in good shape. Ah a favourite place of mine! My partner when I lived in London was a graduate and apparently I started to talk like a toff … many moons ago. How lovely, so pleased my post brought back some fond memories. I love the round church! I liked that too, thank you. Thank you for your kind words. I do so hope you have an opportunity to visit Cambridge one day. Awesome architecture. Your pictures allow us to be there seeing it, thank you. Thank you for your much appreciated words. A great post with wonderful photos! Thank you so much for your encouraging thoughts John’s, they are much appreciated. Lovely tour around Cambridge – it’s years since I’ve been there but we must go back!! Thanks Joy. I hadn’t been for years either but I enjoyed wandering round despite the wet weather. Photos are awesome!!!! Thank you for sharing, I have never been to Cambridge myself yet, but definitely it’s on my bucket list, especially after your post! Best regards! Thank you for your kind words Nadia. I do hope you get an opportunity to visit Cambridge soon. Have you been to Oxford? I loved it a lot!!!! I’ve visited Oxford a couple of times and liked that too. But it’s quite awhile since I was there, I need to go back. Wow! What a great post! I had no clue Henry VIII founded Cambridge nor 32 Nobel winners – I love learning these things and what a fun tour for me to go on – thanks! Thank you so much for your encouraging words. It’s good that you find my posts interesting and that gives me the confidence to write more. Thank you for both reading and commenting on my post. It’s a beautiful compact city to visit even in the rain! Thank you so much for your kind words. I’m glad you enjoyed my post and hope you will have an opportunity to visit Cambridge before too long. Thank you so much for your inspiring thoughts they are much appreciated. I also liked the appearance of the Mathematical Bridge. I absolutely love Cambridge, especially the university, and your photos do its beauty such justice ❤ glad you had a good time! Thank you for your inspiring thoughts. It’s good to read that you also enjoy visiting Cambridge, so many beautiful old buildings to explore. I love Cambridge, what a beautiful town. Thank you. It was a pity it was raining but Cambridge is always a great place to visit. Lovely photos and great write up! I remember my visit there some years ago and even got to listen to the choir of King’s College which was wonderful. A truly lovely place is Cambridge! Thank you for reading my post and your kind words. It must have been wonderful to have the opportunity to listen to the King’s College choir. I have only seen them on television! Thanks Marcus, it was a cold damp day so it’s surprising that the photos weren’t covered in spots of rain. I had a great time looking round, just a shame my husband was stuck in a meeting for most of the time. M.
Absolutely breathtaking images! How lucky you were to visit. Thank you for reading and commenting on my post. I was very fortunate to be able to spend a day touring some of the colleges and the city itself. Gorgeous. Why can’t we create buildings like that now? Thanks Coral. That’s just what I always think, too. Our ultra modern glass and steel buildings such as The Shard have nothing on these masterpieces. Really great pictures there. How interesting it would have been to attend Oxford or Cambridge for my upper level education. Both Oxford and Cambridge are beautiful cities and their colleges must indeed be wonderful places to study Ian.